Authors of research articles frequently forget to report details about their study which are important for readers to know. This can delay publication and stop their work being used, cited or replicated. This is a waste of the human and financial resources invested in the research. Reporting Guidelines and checklists have been developed for a wide variety of research types and study designs which set up the most important things readers need to know about your work. 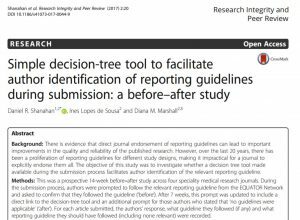 EQUATOR have created a simple flow chart to help authors, editors and peer reviewers find the most appropriate checklist and reporting guideline. We have also collaborated with Penelope Research to develop an online wizard based on the chart. Version 1.4 of the online wizard aims to help you find the the most appropriate reporting guideline, and directs you to an online fillable checklist to submit to a journal alongside your manuscript. The prototype online EQUATOR wizard was piloted by BioMed Central in February 2016. It was embedded it in the submission system for four BMC journals and the promising results of a before-and-after analysis were published in Research Integrity and Peer Review in December 2017. 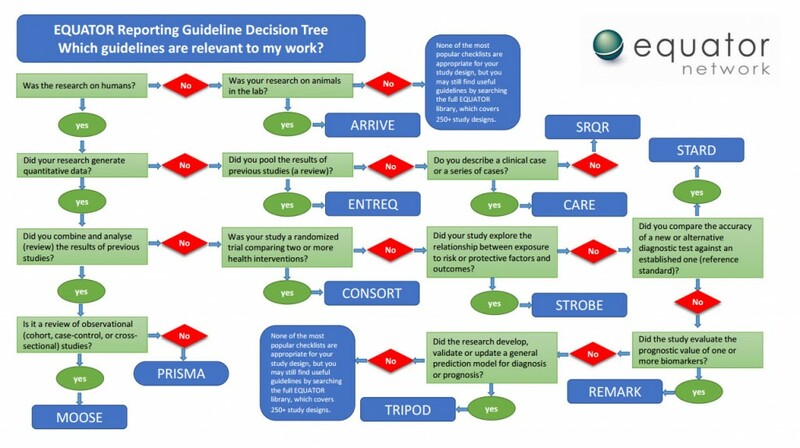 You can also search the EQUATOR Library of Reporting Guidelines, or read more about different study types on the website of Oxford’s Centre for Evidence-based Medicine.